One of the great things about blogging is the people you meet along the way. The relationships and support you gain from online strangers who quickly become friends and those you get to know in ‘real life.’ I am so happy to have gained these friends over the years and enjoy making new friends as well! 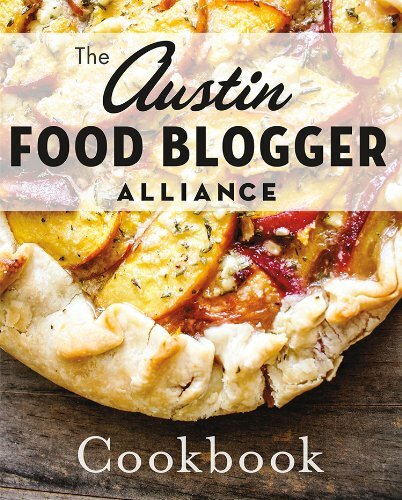 One organization that I was ecstatic to find, was the Austin Food Blogger Alliance. Austin is an amazing food city, so it shouldn’t come as any surprise that it is filled with an awesome group of food bloggers. And by group, I mean well over a hundred (and counting)! I have been a member of this fine group of food lovers for almost a year and have meet some pretty cool foodies. The organization itself offers many educational opportunities and fun social gatherings. One project they took under their belt was putting together, and publishing, a member cookbook. Unfortunately, I joined the organization right before the recipe submission deadline, so I wasn’t able to get any recipes submitted in time to be included (hopefully there will be a volume two in the near future!!! ), but I have thoroughly enjoyed watching this cookbook grow and evolve! Pictures: Yes, this cookbook is filled with beautiful photos! Not every recipe has a photo but most do and are from they are from the blogger who submitted the recipe or other talented food photographers that are members of the Austin Food Blogger Alliance. Prep Time, Cooking Time, and Number of Servings listed: Unfortunately none of this information is provided. Clear, easy to follow directions and ease of preparation: Yes, most of the recipes are fairly easy to prepare and have clear directions. Part of the process of compiling all the recipes and putting together the cookbook, was having members test the submitted recipes to make sure the directions were easy to follow. Easily available ingredients and budget friendly: For the most part all of the ingredients are easy to find and are affordable. Variety of recipes: This cookbook has a variety of recipes. From breakfast, soups and salads, appetizers, dinner, side dishes, desserts and even a section on canning and condiments. Special feature: In true blogger fashion, each recipe has a personal story introducing it. It was fun going through the cookbook and seeing the different recipes and hearing the different bloggers’ personalities shine through their stories and recipes. Scattered about the book are several articles written by members, on various topics, from Austin’s love of food trailers to locally brewed beer; to food photography and canning tips. And in true Austin fashion, you can find a variety of recipes that meet various dietary restrictions from gluten free to vegetarian. The cookbook also contains a list of AFBA members who contributed to the book and a short bio on each member. However, my one (and only) tiny complaint about the cookbook is that the recipe index does not list the contributing members names and the title and page number of their recipe. Neither does the blogger bios, which is a bit frustrating if you wanted to look up a recipe from a specific blogger. Other than that well done Austin Food Bloggers, great book! The Austin Food Blogger Alliance Cookbook can be purchased on line at Amazon and Barnes and Noble or can be found at local Austin stores including Book People, Whole Foods and Central Market. 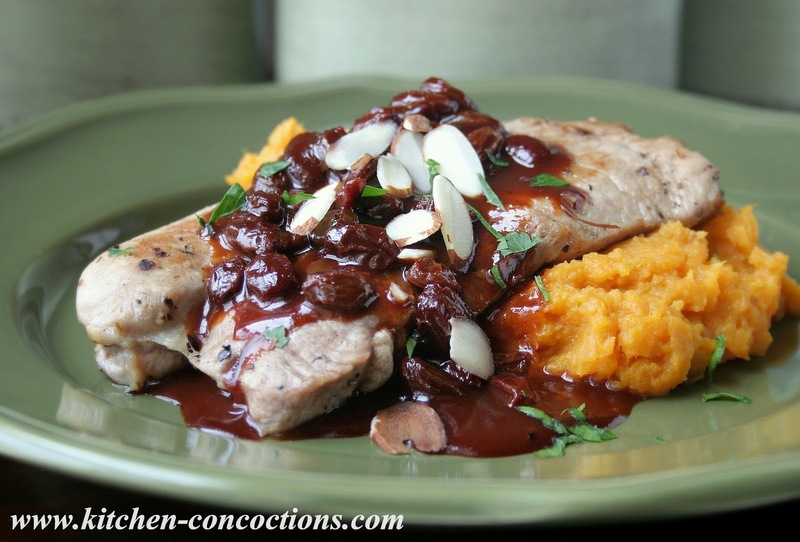 I have like the entire cookbook flagged for recipes I want to try but I was intrigued by Ancho Chile Cherry-Raisin Glazed Pork Chops submitted by Anna Ginsberg of Cookie Madness (as Anna writes in the book that this pork recipe won $10,000 for a recipe contest) and made it first (with a few changes). These pork chops had a unique flavor profile. 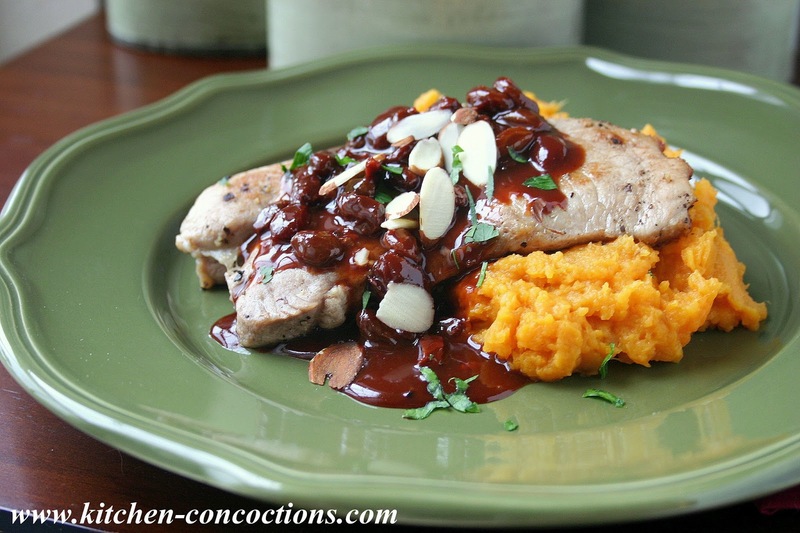 Rich and smokey with bursts of sweetness from plump, chewy raisins; the perfect paring for some mashed sweet potatoes! In a jar or container with a tight-fitting lid, combine cherry preserves, ancho chile powder, cinnamon, cocoa powder, vinegar, lemon juice and cornstarch. Set aside. Heat a large non-stick skillet, over medium-high heat. Add almonds and cook for 2 to 3 minutes or until lightly browned. Remove and set aside to cool. Season pork chops with salt and pepper. Add oil to pan and add pork chops; cook over medium-high heat, two minutes per side. Pour in 1/3 cup broth and continue cooking for 6-7 minutes more, turning once, until pork is done. Remove from pan, set aside and cover with foil to keep warm. Shake jar with preserve mixture and add to skillet. Stir in raisins and cook over medium heat until sauce thickens, about 1-2 minutes. Add remaining broth, stir and heat through. Arrange pork immediately on serving platter and top with prepared sauce; sprinkle with toasted almonds and cilantro (optional). Serve at once. *Note: White wine or white grape juice could be substituted.